....The most effective link between the two periods of Persian history, however, was a linguistic one. Most of the countries that were conquered by the Arab armies in the first century of Islam, when the new religion was at the height of its drive, lost their language to Arabic and eventually shed their previous identities, becoming "Arab." Such was the case with Iraq, Syria, Egypt, and much, of North Africa. Persia was a notable exception: although conquered completely and absorbed inextricably into the Muslim world, it nonetheless retained its language and its identity. The Sassanians had strongly promoted the language of their homeland Persis (Fars), making it the official tongue of their Empire. This language, called Middle Persian in modern scholarship, continued to be used in Iran after the Islamic conquest; it underwent some gradual changes and emerged in the ninth century as the language of a "renaissance" in Persian literature. In the process, its grammar had become simpler, it had borrowed some vocabulary from Arabic, and it had shed a number of words with Zoroastrian connotations or else adapted such words to the prevailing Islamic environment. 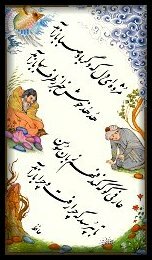 It is through this later language, called New Persian (or simply Persian) that the literary gifts of the Iranians found their major channel of expression.